The item was sent for the purpose of review. All thoughts and opinions are our own. 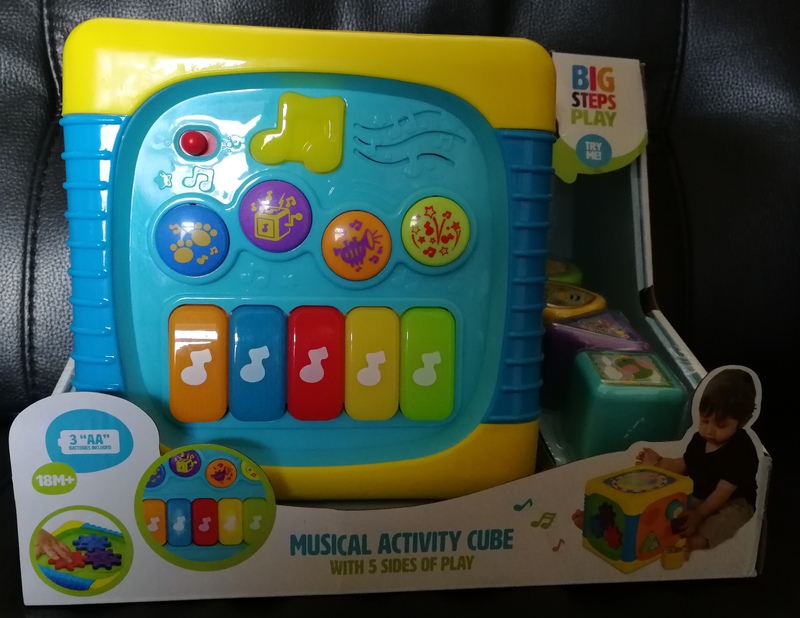 You may have seen our recent post about the Smyths catalogue and we have been lucky to have been sent an item from their Big Steps range to review, the Musical Activity Cube. 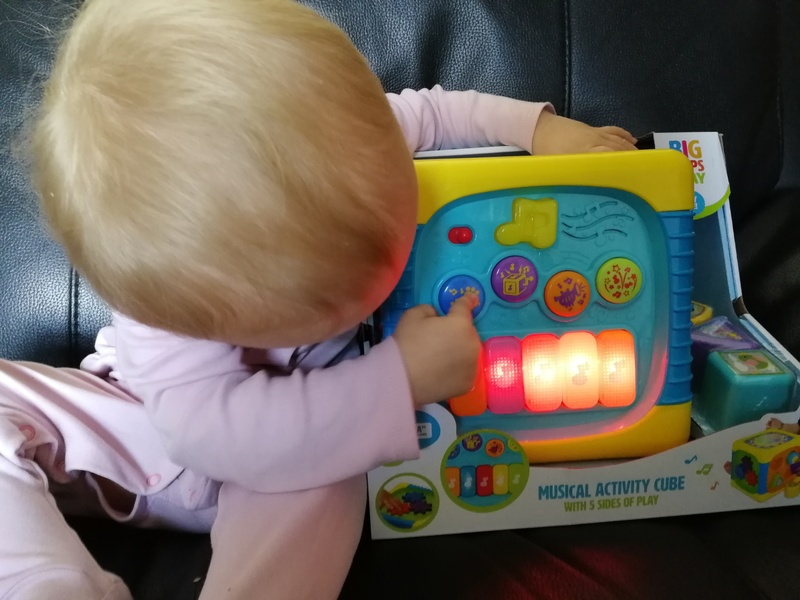 As you can see, Olivia couldn’t wait to get playing with it as soon as it arrived! 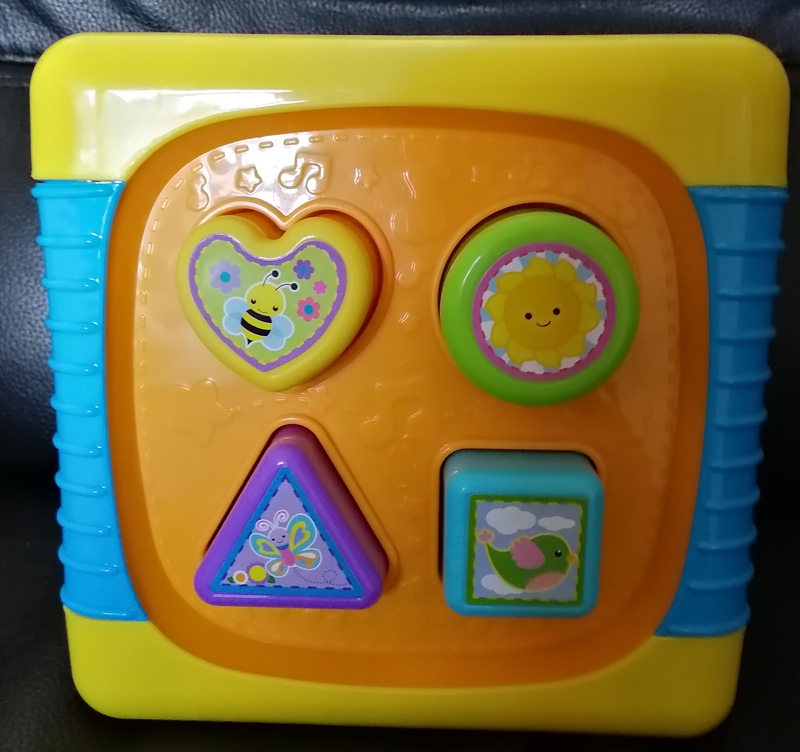 For ages 8 months+, this activity cube has five sides of fun. 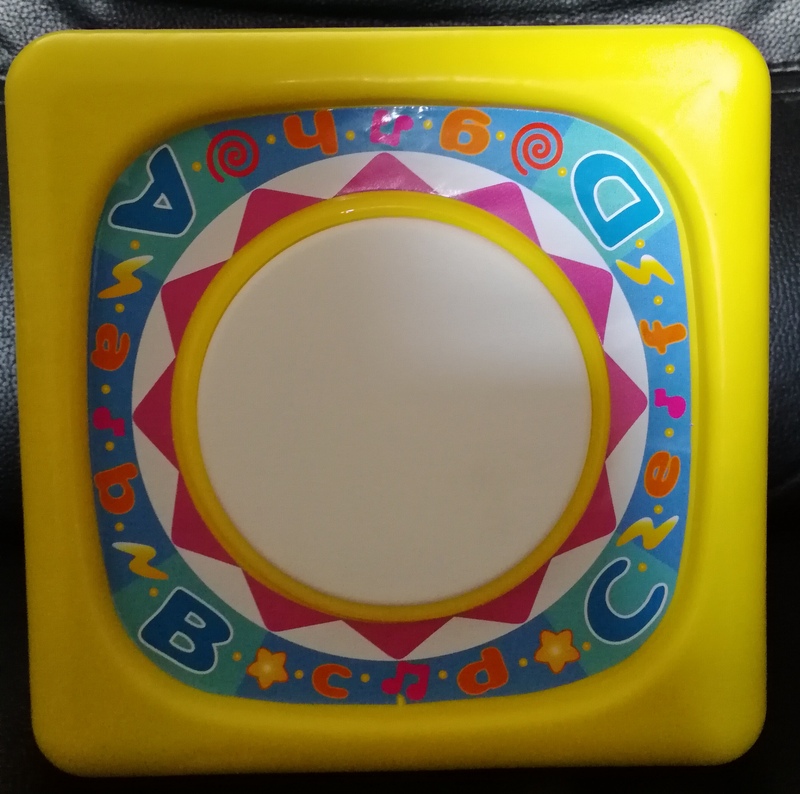 There is a drum pad with accompanying drum sounds and it lights up too; a 5 note light up keyboard; turning gears and a wiggly slider; a mirror for self discovery (my girl loves a mirror!) 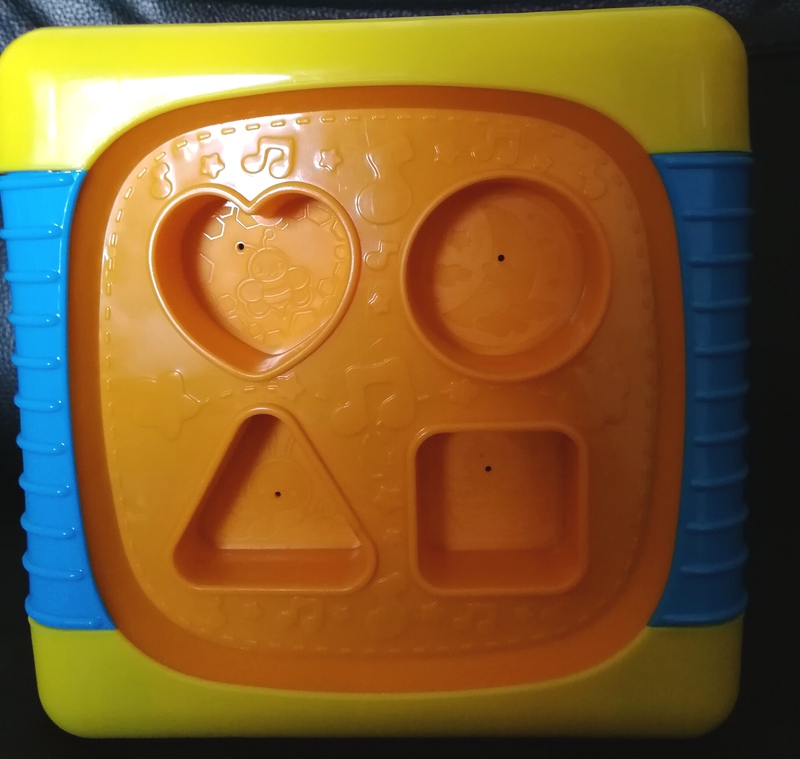 and a shape sorter with 4 shapes. The cube itself needs 3xAA batteries which are included, thankfully! The five sides of fun offer a wide variety of skills and play options. 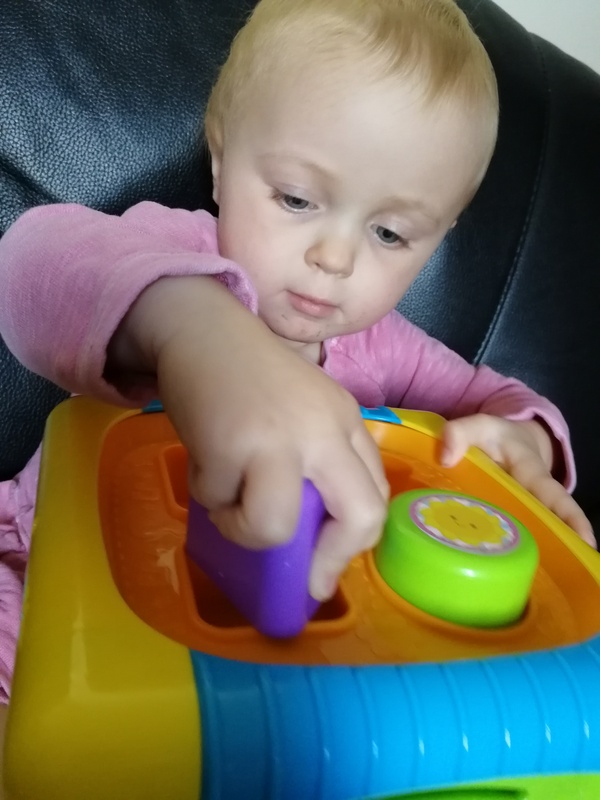 It helps with their sensory development as they discover the world through playing, exploring the sounds with the keyboard and the drum, responding to the incredibly bright colours and helps them to recognise shapes and other objects by touch. 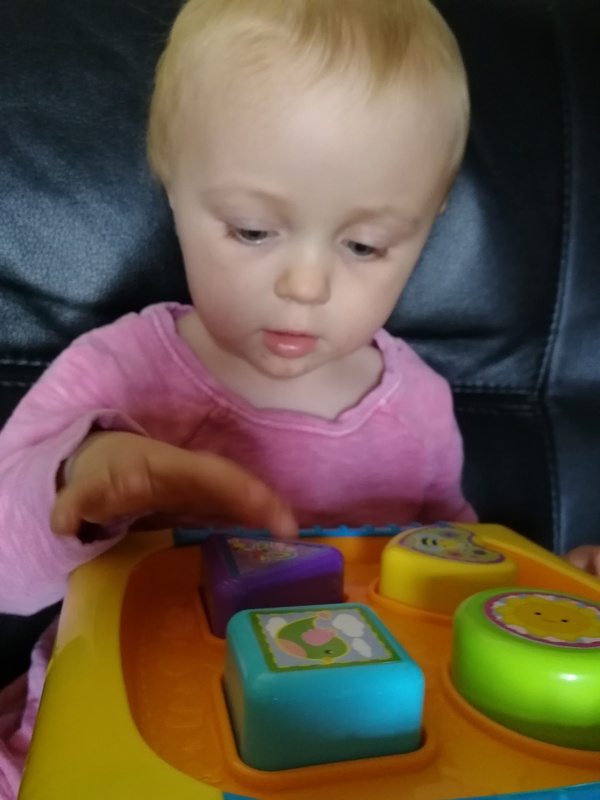 It also helps with their motor skills as they can help children to develop gross and fine motor skills, putting shapes in holes and developing hand-eye coordination too! 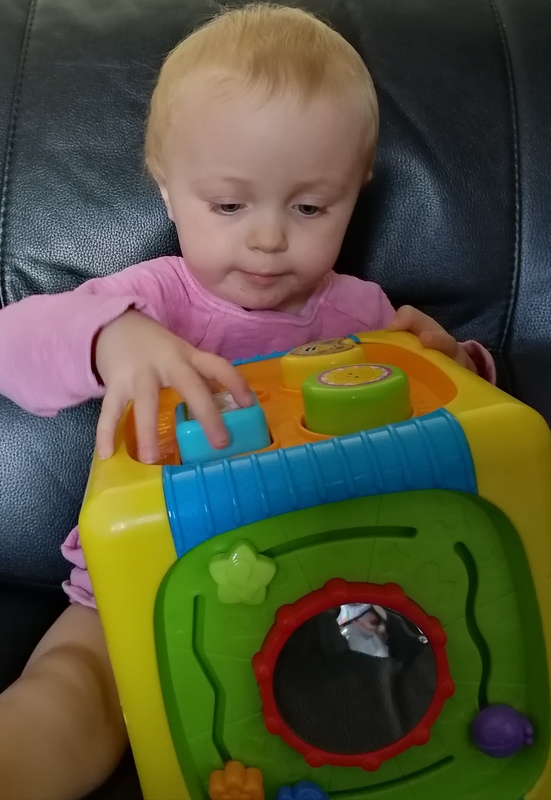 With Olivia still being young, we are keen to develop her fine motor skills and her hand-eye coordination and she is doing well. 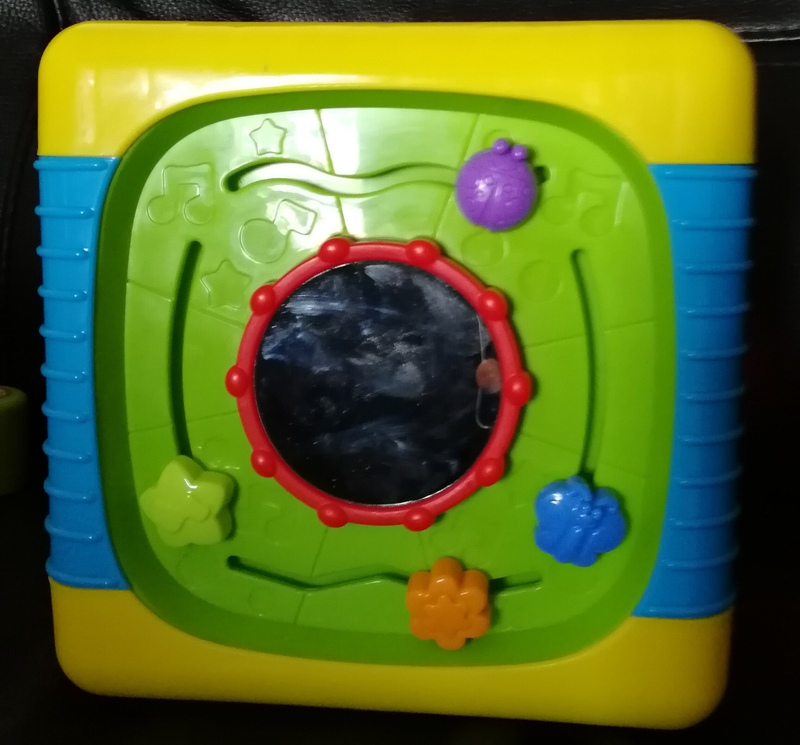 This toy has been ever so popular since it arrived in our house – she’s always trying to put the shapes in the correct place or hitting the drum. Retailing at £14.99, it is one of the more affordable activity cubes on the market and is part of a much bigger, brilliant range. 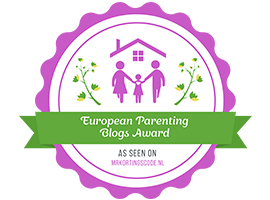 The Big Steps range looks great – and we’ve kindly also been gifted a Smyths giftcard so we can try out some more of the range if we so wish. We’ve already got a list of a few toys we’d like to get Olivia for Christmas and her birthday in early January. The concept that ‘it takes a lot of little steps to make one Big Step’ is so true – and the range truly shows that they are keeping to this ethos. Overall, I was very impressed with this product. 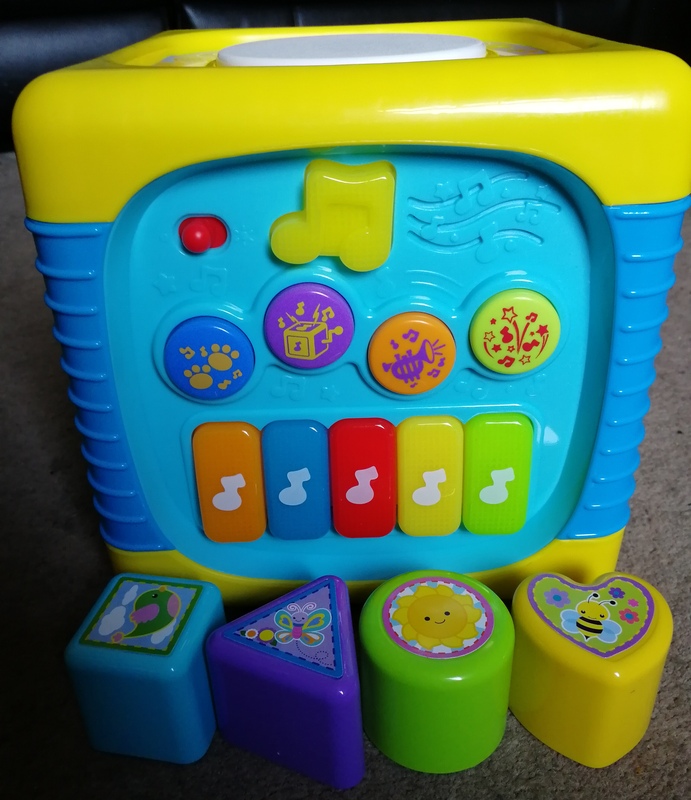 Batteries are included, it is an affordable price, it is noisy but not too annoying as some children’s toys can be and it also helps aid young children in learning new skills. 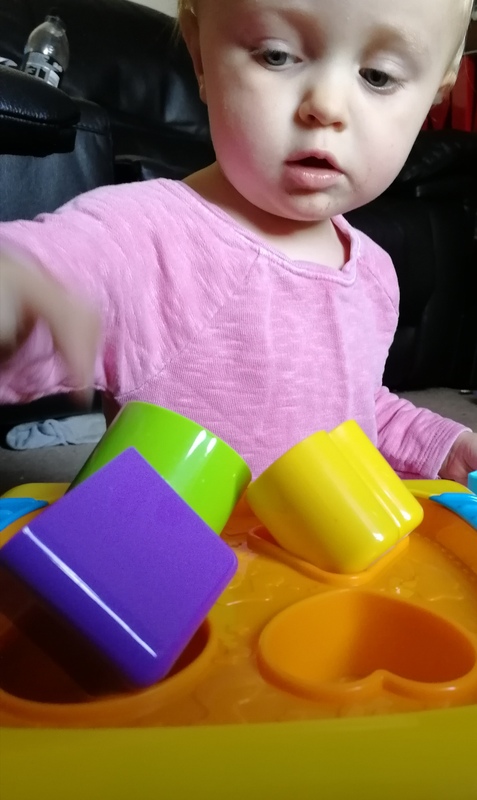 Olivia has been using the shape sorter mostly recently, trying to put them in the right place. Olivia has enjoyed the product immensely – barely leaving it alone. 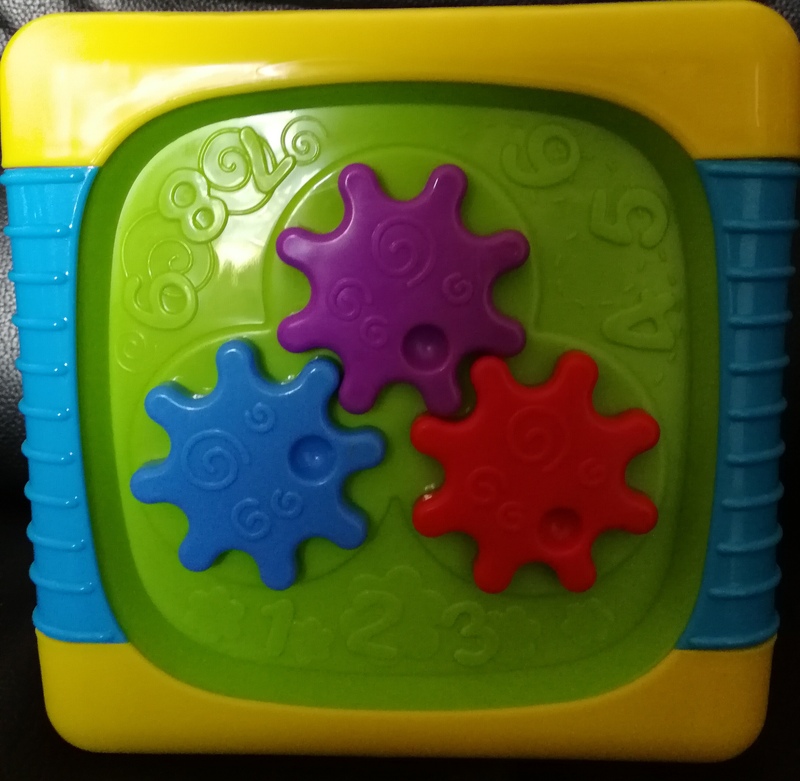 With Christmas coming up, I’d definitely recommend this for little ones in your family – it is a great price and great for helping them with their motor skills. I’m sure it would be truly appreciated. 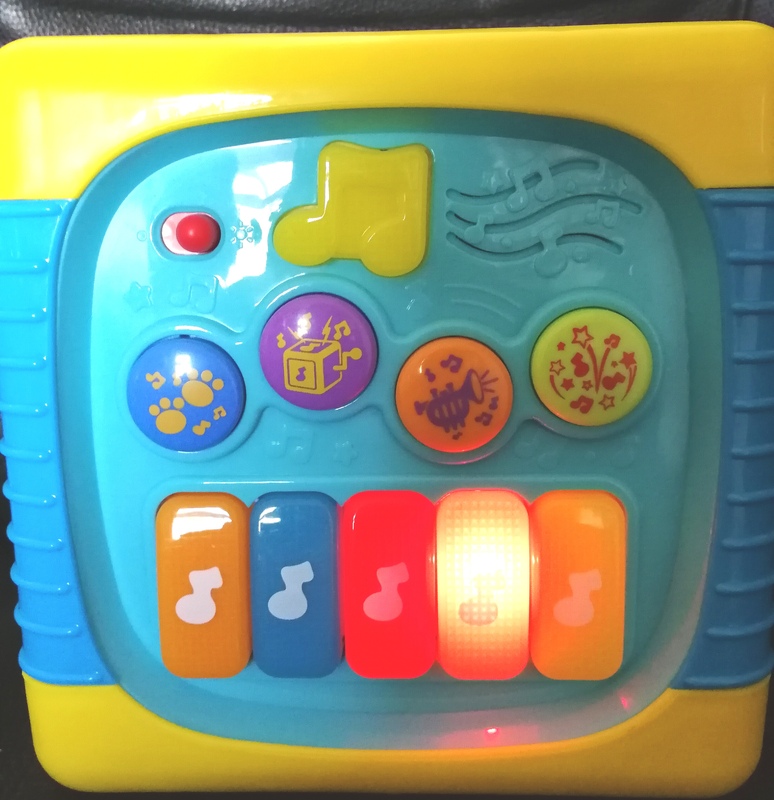 I love that there’s so much engagement built into one toy with the lights, sounds and shapes! What a fabulous toy for your little one. I love toys like this as they teach concepts such as shapes etc while having fun. How adorable are the photos of your little one! Oh that looks great! Mine are all too old for this now but they woudl have loved it when they were a little younger! Oh I love toys like this that have so many different elements to them. Lovely photos. This looks like a great toy for little ones. I love that there is quite a lot to it. This looks so good and I’m so out of touch with baby toys I needed some hints for Christmas!